It frosted but our crops are mostly fine. Check out these pumpkins! We were holding our breath last week as there was a frost advisory for the whole north country. We prayed and hustled to try and protect everything we could. We closed up the hoop houses where the peppers are housed, threw blankets on some of our plants and tarps over others. Then dark came and it was cold! Well, come morning, there was frost and it was 27° F. Sigh. We just had to wait and see how bad it had gotten. Later in the morning, I walked down to the main garden after seeing limp bean vines and cucumber plants in the house garden. Yep, it was bad, alright. All the tomatoes, my dalias, cannas, and glads were toast. I cautiously peeked under the tarps David and I had placed over the Bill Bean tomatoes. The plants were black. The corn was burned as were all the rest of the crops we had not covered and even those covered with plastic. But the ones covered by old quilts were fine. Lesson, here. Cold travels through plastic faster than quilts. It’s fine if there is just a frost but it had gotten down to 27 degrees. That’s freezing, not a frost. I was hugely impressed with Aker’s Paste: all of these came off one plant! But, over all, our garden did well. We’re still harvesting dry beans and even some snap beans. The squash and pumpkins were largely untouched by the frost. 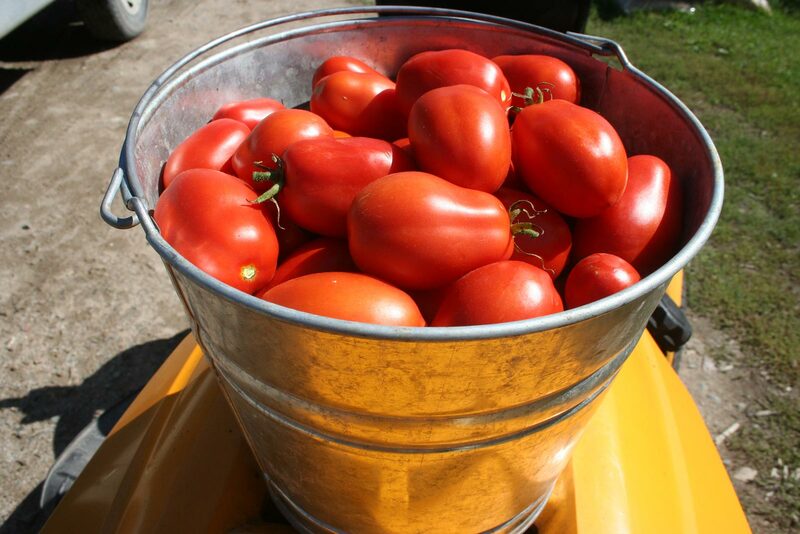 Same with many of the tomatoes. I don’t think it was cold for long, and although the plants were killed, the fruits were not damaged. So I have been busy trying to put up all I can. Before the frost, I spent all day picking the best of each variety of tomato to save seeds from for our seed business, labeling them and bringing them in the house. Then I started putting them in the hoop houses as my knee disliked going up to the house so many times — up and down the hill — I finally got them all. Whew! Then David came home from work and gave me a hand. Will was harvesting oats at the neighbors and didn’t know it was going to get so cold as in the morning, there was only a “chance of frost in low lying areas” with a temperature of 35° F. Of course, he couldn’t hear the phone ringing over the combine! And he had the pickup so I was vehicle-less. It turned out fine though and our pantry shelves are bulging. Nice feeling! We love the cute cherry tomato, Dances With Smurfs. It tastes great and is gorgeous. Even our muskmelons (planted outside with no plastic mulch or row-cover) and watermelons exceeded our wildest dreams. 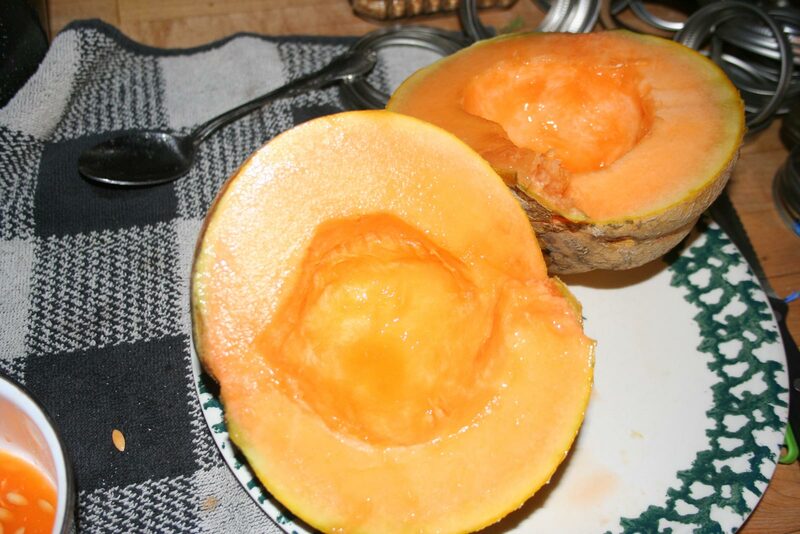 Our Oka muskmelon was fabulous. Great flavor and productivity with no pampering. Thank you, Jackie and Will for the tomato seeds. Doug and I are thrilled. We’ve canned and gardened busily all summer and are finishing up here, too. We haven’t had frost, but the cool nights are causing some things to peter out. We love reading your blog, and learn so much from you. Thank you for taking the time to keep up with a blog and your seed customers on top of all the hard work you all do. I totally understand. I’m not sighing yet as there is still so much harvesting to do, then the garden clean up to follow. But I’m really, really grateful for our fantastic garden this year! What a heartbreak! You certainly have had quite a year. Blessings as you go forward. Well, we were sure sad, but not heartbroken. The blessing was that although the plants died, the tomatoes, squash, melons, etc. are still okay for the most part. Hey Jackie, it’s finally cooled down to the high 90’s here in my part of AZ. 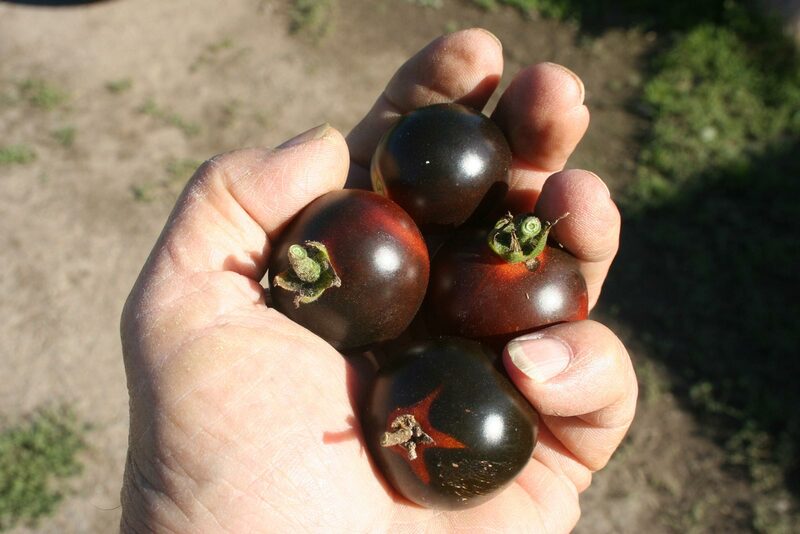 I harvested a two pound bill bean tomato this morning. Plan on having BLT’s later today. It was the only tomato the plant produced but was by far the largest I’ve ever grown. It was still greenish on top but was splitting at the bottom so I had to pick it to keep the bugs out. I hope it tastes as good as it looks. We might get frost sometime around the middle of November–maybe. I hope your Bill Bean was as good as ours always are! Sorry your plant only had ONE tomato, though. Ours are always loaded with big guys. In the heat a lot of tomatoes shed their blooms instead of making tomatoes. I hate you; frost maybe in the middle of November??? Lol. Hi, I had very bad knees as well, but they didn’t want to do surgery till I was 60. This was about four years ago. I tried all kinds of therapy and supplements, but I only got worse. Felt like an old granny. Had to give up my housecleaning jobs, gardening, biking etc. Then I went to a sport rehabilitation centre. They took X-rays, came up with a plan which involved shockwave therapy ( this crushes the calcium deposits. After one session I could vent my knees a bit slready. I did about 15 sessions and in the meantime in the morning I take first a glass with warm water, juice from a lime or lemon, 1/4 tsp Himalayan salt and a few shakes of cayenne pepper. Then once a day I take organic fresh or dried sliced turmeric with a few shakes of black pepper and. Healthy fed, like an egg. And in the morning I put about a top frezh or dried organic ginger slices in my tea bottle and add only boiling water. I fill it up with water several times a day. And now my k red are not inflamed anymore, I csn garden snd housevlean sgsin snd I notice more improvement. Oh and I wear compression knee highs most of the time. I first tried several different kind of organic turmeric capsules and yes but nothing worked for me. I hope this can help you. Boy, I’m happy for you! I don’t have calcium deposits in my knee joints so what worked for you won’t do it for me. But I sure am not giving up! A friend has had excellent luck with an organic mixture in capsule form that has help not only her knee swelling and pain but also diverticulitis, which I suffer from…although much less than before as I’ve learned my triggers for attacks. So I’m set to try her supplements and praying for a miracle. Oh no! So very sorry. So is every thing left unlocked a total loss or will you be able to save anything. Every year I am amazed that Y’all have such cold this time of year as we sit and shelter in our September heat. Good news! Although the plants were mostly killed, the fruits are mostly fine so we are continuing harvesting, full bore. Now we’re enjoying Indian Summer and busting our butts! 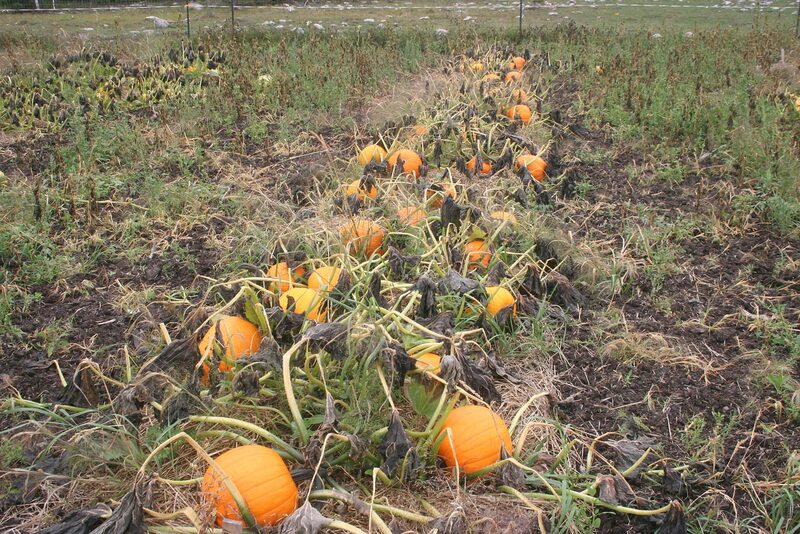 Your pumpkin crop looks great! How do you keep squash bug population down in a big patch like that? I find this time of the year to be bittersweet – I hate to lose anything to frost, but I also have a sigh of relief knowing the end is in sight. No frost here yet, but I lost a lot of my vines to squash bugs this year. Will focus on a good cleanup this fall and break out the BT early next year. I finally got the Cabbage Moths under control this year – it was like the Squash Bugs were mocking me because I was so happy with my beautiful broccoli. I’m not able to have a garden anymore, but I really really love hearing about yours and the other adventures in your life. God bless and keep you.